WEEK 19: To know or not to know ? Week 19 is perhaps the time you’ve been waiting for! The week where you most probably will find out whether you’re having a boy or girl at your mid-pregnancy ultrasound. Although most moms-to-be feel that this test is done to reveal your baby’s gender, it actually will show all the body parts of your baby, and will leave you in a state of awe. 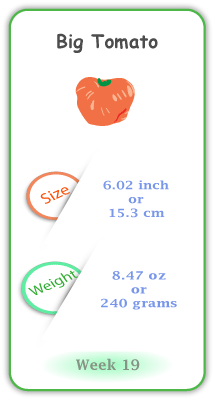 Your baby at 18 weeks pregnant has formed all of its parts, and is similar to the size of a mango or grapefruit. The symptoms you experience in week 19 of your pregnancy aren’t severe, but they can be annoying. 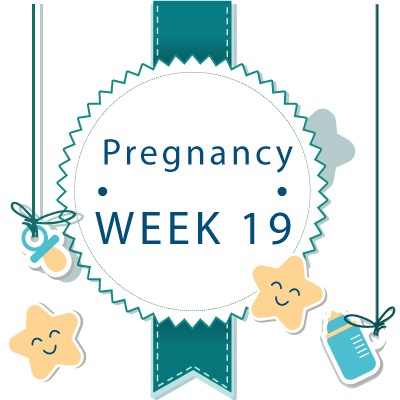 This doesn’t mean that dealing with them is going to easy, but you will of course get through these common symptoms of week 19 pregnancy. These are generally felt in the lower part of your belly, and are caused mostly by your belly stretching to accommodate your growing baby. Feeling faint and lightheaded is caused by the pressure applied by your uterus on the blood vessels. Adding to this, your baby has taken up a lot of room, so the amount of oxygen for you is less. Other things that can contribute to dizziness and lightheadedness include hunger and dehydration, so ensure you eat regularly and drink lots of fluids during pregnancy. This is caused by the change in sleeping positions, and can be much more severe if you’re pregnant with twins. Owing to the surge in estrogen, you may notice patches of darkened skin. These patches are referred to as chloasma, or the "mask of pregnancy" when they appear on your upper lips, cheeks and forehead. Not to worry because these will fade shortly after delivery, but be sure to protect yourself from the sun’s harmful rays and use sunscreen when you’re outdoors. Weight gain when you’re 19 weeks may concern you given that you’ve probably gained approximately 8-14lbs so far or 20 – 30lbs if you’re pregnant with twins. Speak to your doctor if your weight gain is higher or lower than the aforementioned numbers, so that they can determine whether it should be a reason for concern. Rapid or sudden weight gain is known as preeclampsia—a condition that needs to be treated immediately. Not gaining weight could mean that your baby isn’t getting its share of nutrients, and your OB will be able to let you know about the alternative options to explore. 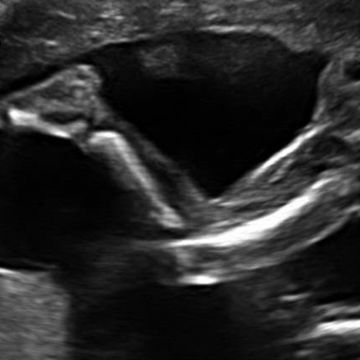 19th Week Pregnant Ultrasound - What to Expect ? 19 weeks pregnant is just steps away from your mid-pregnancy ultrasound. At this ultrasound, your OB or technician will scan most of your baby’s body including the spine, brain and heart to ensure there aren’t any issues with its development. The best part is and if you’re curious to know your baby’s gender your OB will be able to tell you at the mid-pregnancy ultrasound. Be sure to leave your doctor’s office with printouts from the scan to add to your baby album. This is however not the only thing you should be looking forward to in week 19 of pregnancy, but you should also ideally be looking for a pediatrician to guide you post pregnancy. Your baby’s organs when you’re 19 weeks pregnant continue to grow. Its brain is in the process of dedicating specialized areas to taste, smell, hearing, vision and touch In fact, research indicates that your baby can hear when you’re 19 weeks pregnant, so don’t feel shy to read out loud or chat up a storm. In other baby growth news, its kidneys continue to produce urine, and skin is covered with vernix caseosa—a waxy protective coating that prevents the skin from pickling in the amniotic fluid. Your baby in week 19 of pregnancy weighs approximately 8.47 ounces and measures 6.02 inches, and is moving often so much so that you may actually be able to feel these sensations. It is working extra hard to grow strong and healthy especially its heart, whose beat can be heard with a stethoscope set against your abdomen. As you’re getting things ready for your baby’s arrival, a topic that crops up often is whether to use disposable or reusable diapers. The choice is truly a matter of personal preference, where each type offers its own set of advantages. Cloth diapers have come a long way since the days of folding toweling squares and the art of pinning them in place. You may even be able to get incentives for going green by using cloth diapers rather than adding to landfills. You definitely should be buying the best there is for your child, but think about saving some cash to pamper yourself too with new maternity wear. Good time to start looking for pediatricians.